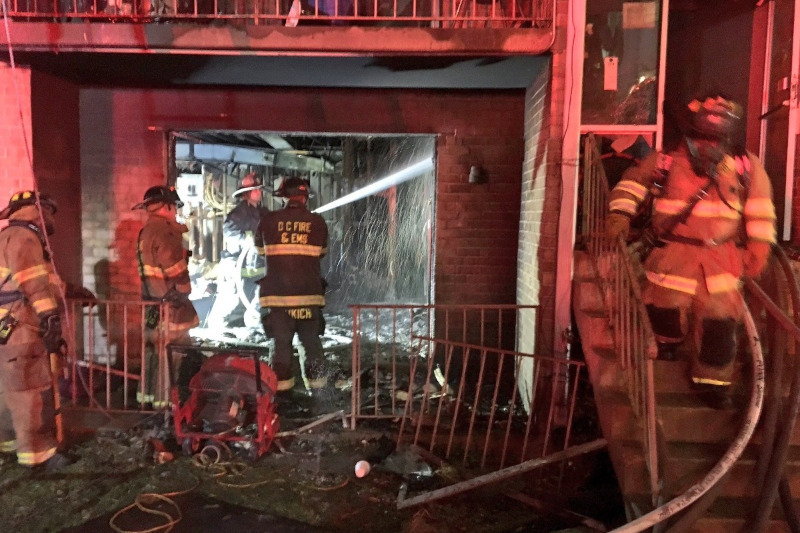 Home > One of three embattled Congress Heights apartment buildings burns. For years developer Geoff Griffis and his friends at CityPartners LLC have been trying to evict the tenants of the Congress Heights apartments in SE DC so a "mixed-use" condo and office building could be put up over the Congress Heights Metro. For years these plans have been stalled by tenant protests and activism. Griffis has had protesters at his house and WMATA refused to sell him a key parcel. Now, on the night of Nov 1 to Nov 2, one of the three buildings has burned. Tenants are urgently requesting assistance to replace possessions and repair fire damage. (GoFundMe page)  Surely CityPartners LLC will give them nothing-the fire is just too convenient for their plans.If the fire damage is not repaired and the tenants are displaced, Geoff Griffis' proposed "Congress Heights Town Center" is at least 1/3rd of the way closer to being built. No matter how the fire started it is highly beneficial to CityPartners LLC, to Geoff Griffis, and to all who hope to replace African-American tenants with "New Washingtonians" in Anacostia. A shiny new mix of luxury housing and office buildings directly over the Congress Heights Metro would establish a dangerous beachhead for what could mushroom into an invasion of Anacostia by yuppies and developers. In that way, the "Congress Heights Town Center" proposal is itself like a sparking, discarded cigarette thrown into dry tinder as high winds blow.